Today we lost one of the good guys. 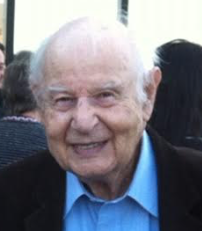 On November 7, 2018 George Orkin Philip died peacefully at the ripe age of almost 94 years young, preceded in death by his wife Mildred, his brother Manfred, and sister Ulla. He was born on December 21, 1924 in Berlin, Germany, and immigrated to this country at the age of 14 years old, speaking no English. With the helping hands of the community in Easton, PA, George became an American citizen. He served in the U.S. Army during WWII in the Pacific theater and later in the Korean War. George graduated from Lafayette College with a BS in Mechanical Engineering and later a Masters Degree in Engineering from Syracuse University. This soft-spoken, incredibly competent, gentle man, together with his wife, Mildred of 60 years (who passed in 2010) raised three children: Donald Philip (Debbie), Hedy Buch (Bruce), and Joan Philip (Dave). This brood went on to have seven grandchildren: Josh, Danielle (Jason), Amanda (Dan), Karen(Rob), Brian, Lisa (David) and Sean (Allison), and 3½ great grandchildren: Asher, Arabelle, Makahla, and yet-to-be-named upon debut. George enjoyed a fulfilling career working for IBM in Endicott, NY, Martin Marietta in Orlando, FL, and RCA in Moorestown, NJ, with a number of patents issued to his credit. He retired in 1989 after which he and Millie enjoyed many years traveling the East Coast buying, repairing, and selling antiques. They were quite the team. George carried his initials, GOP, with pride and beat the drum until 2016, when he was dismayed by the turn of events. He was ever hopeful that his Grand Old Party would return to its true conservative footing. George moved to Westborough, Massachusetts in 2005 and was devoted to caring for Mildred. He converted easily from an Eagles follower to a true Patriots fan and even more quickly to a Red Sox believer. As George settled into New England life, he rekindled his pursuit of various interests, including lapidary, stained glass, and his love of classical music and opera. He appreciated art in many forms and loved visiting museums in the region and in Europe. This inspired his designs of various stained glass projects, one of which hangs in the dining room at the Willows. In his life, as a husband, a father and as a professional, there was no problem that did not have a solution and no worry that couldn’t be assuaged with a good dose of calm, cheerful optimism. Curiosity was a mainstay and he loved anything scientific and technical. He approached each day with gratitude for his life and appreciation for those around him. He was a gentleman, a good and decent man. The family would like to especially thank Hedy and Bruce Buch for the loving care of our parents during their road to end of life. Anyone who has ever done this knows of the unique support and love they provided to both and each of our parents. We are forever grateful.